"Shying away from the typical tomato or wine based steamed mussel recipe? This one features tequila and lime and it as easy as 1..2..3 to prepare! Serve right away with some crusty Italian bread to soak up the juice." In a large pot, heat oil over medium heat. Cook red pepper and onion in oil, stirring frequently, for 5 minutes. Stir in tequila, water, lime juice, fresh pepper and jalapenos. Bring to a boil, and dump in the mussels. Sprinkle the cilantro over the mussels, and cover with a tight fitting lid. 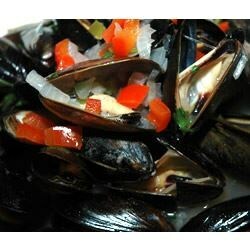 Allow to steam for 3 to 4 minutes, or until all mussels have opened (discard any that don't). Quick and easy to make with stuff we had on hand, including jalapeños. This recipe is better than most restaurants. Didn't change a thing! I wasn't sure about this...the family always eats the mussels the same way but they liked it! A lot! I used vodka instead of tequila and added 3 teaspoons of horseradish too....just for an extra kick. They were great.